This post is inspired by my reading of Malcolm Gladwell’s most recent book, “David and Goliath”. It was compelling as all of Gladwell’s books are, with story after story built to emphasize the point that things are not always as they seem. Weaknesses may be strengths. Disadvantages may be advantages. What we think is good and positive may be the opposite, and vice versa. This line of thinking is both uplifting and hopeful. I have many aspects of my character and upbringing that I consider to be disadvantages. This book challenged me to examine those things, and see how the supposed weaknesses could have hardened and strengthened me in some mysterious way. This post will summarize my main learnings from the book, and also discuss a few insights I have come away with about how Gladwell’s theories might apply to other areas of my life. In reading this post I hope that you too will consider your weaknesses to be potential sources of power in your life. Gustave Doré [Public domain], via Wikimedia Commons. I’ve heard the story many times, of a young Shepard boy felling a giant with nothing but a stone and a sling. However, I never heard it the way Gladwell tells it, in excruciating and captivating detail. Wasn’t this story fantasy? How could he possibly know all of these details about the battle? Turns out there is a fair bit of expert commentary on the battle of David and Goliath. Archeologists and historians have examined and pieced together exquisite details of the confrontation. Spend some time searching and you will find assertions of proof that the epic battle did indeed happen – some from scientists and others from those dubiously seeking to “prove” the events from the bible. There are also many hotly contested points. Regardless of the validity of the original story, the outcome is plausible if you believe Gladwell and assume that the brawl did indeed happen in the first place. Gladwell interprets the result, of a young boy slaying a warrior, not as a story of triumph, but as an outcome that was all but certain by anyone who knew of the unfair advantage David possessed – the slingshot. The slingshot, in the hands of a seasoned assailant, is wickedly deadly. 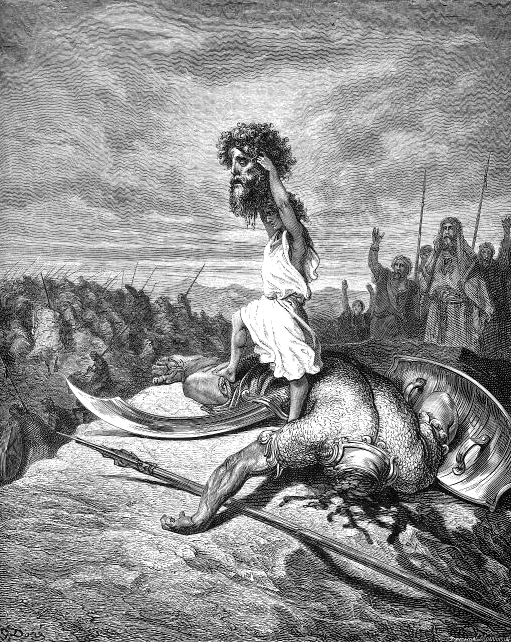 Goliath didn’t stand a chance, despite his imposing size. Most people would consider a boy facing a fully armed and well-trained soldier as a terrible mis-match. In this case, the underdog was able to use his apparent disadvantage as his unique advantage. Using this story as an entre, Gladwell then applies the same principle – that of uncovering the hidden strengths behind apparent weaknesses – to other areas of society. There are many conventional notions that are challenged in the book, here are a few of them that stood out to me. They all follow what Gladwell calls “The Inverted U – Curve”. This is where something that is seen to be good, stops being good after a certain point. 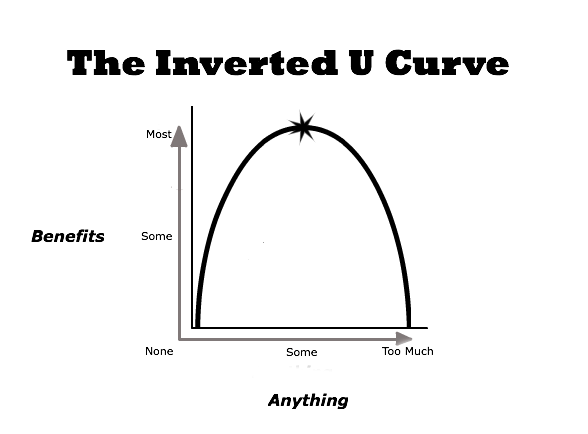 Not only that, but The Inverted U – Curve illustrates that too much of a good thing is actually far worse than having just enough. Let me explain it this way. If you cook a nice meal and forget to add salt, it probably won’t taste great. If you add a little extra salt it will probably taste a little better. Add the entire bottle of salt and it will be inedible. Here are a two areas where Gladwell says there is a certain benefit for not having too much of a good thing. In the book he goes over many more areas than this. These two stood out for me. Gladwell posits that it is better to be a big fish in a little pond, than a small fish in a large pond. This means that while high school students might think going to a school as prestigious as Harvard or CalTech is worth it, going to a State University might provide an even better results for the large number of high achievers who end up becoming “just normal” at an outrageously competitive school. The effect of being just normal when you are used to being outstanding, can be devastating. Personally, I went to a State University (Penn State University) where I earned my way into the Honors College. After being denied entry to the prestigious Schreyer Honors College at Penn State, I petitioned the University after my first semester and they let me in. I ended up graduating with distinction and honors. While I wanted to attend an Ivy League University as a kid, I ended up getting wait-listed at my #1 college choice (University of Pennsylvania) and decided it would be best to pay 1/3 as much tuition and go to Penn State instead. I had a blast at Penn State and ended up getting a good choice of internships as a result. I was able to stand out, despite the large student body, and I think this did a lot for my weak self-esteem going into college. I joined a variety of club teams that probably wouldn’t have existed (or I would not have had time to participate in them) that made a lasting impression on me – particularly the Cycling and Triathlon Clubs. Who knows what would have happened had I gone to a cut-throat Ivy League school where everyone else was also towards the top of their high school class. More money is better, right? Research has shot many of holes in this common way of thinking. While being poor and not being able to put food on the table is a terrible state to be in, having a Scrooge-McDuck vault full of gold won’t make you that much happier than someone who is holding down a solid job making about $75,000 USD per year. The $75,000 happiness threshold stems from analysis done by Daniel Kahneman and Angus Deaton from Princeton University. They analyzed the results of hundreds of thousands of survey responses to a Gallup Poll, which showed that while people “evaluated their lives” more favorably with higher incomes, emotional well-being did not progress for those more than $75,000 a year. Not only does money apparently stop buying happiness after a certain point, according to Gladwell, having too much money is actually detrimental to your overall chances for success and fulfillment in life. It means that your children won’t have to hustle and think creatively to pay for stuff. It means that your own intrinsic motivation to find new ways to earn won’t be as pressing. Having just enough money maximizes your happiness and internal drive to make a living while not lulling you into complacency. This concept explains why many young people who inherit large sums of money fail to make their mark on the world in the manner of their parents. It also explains why many tycoons are choosing not to leave large sums of money to their children, though of course their kids will have other untold opportunities by virtue of their family names. Theses tycoon who do not plan on leaving their fortune to their children include: Bill Gates, Warren Buffett, Michael Bloomberg and Ted Turner. Reading this book got me thinking a lot about my own disadvantages and how they can actually be my biggest strengths. There are three that come to mind right away. Since I was 10 years old, I was introverted. My family told me stories about how I used to always be talkative and the life of the party when I was very young (ages 4–10). However, as I grew older, this became less the case. Perhaps it was that I gained a ton of weight around age 9 (and kept it on through age 16). Perhaps it was since I started to develop nearsightedness (but didn’t get glasses until much later) making me more comfortable spending time lost in thoughts residing in my own head vs engaging with the outer world. Whatever the reason, I developed a tendency for introversion – that is to say, I preferred thinking instead of talking. I was comfortable this way, and even today, I can’t stand it when people I hang out with talk all the time. It’s bothersome and in my mind, totally unnecessary. So much can be said without speaking. This introversion tendency has played out very well for me. It has helped me in doing great work during my corporate career, where toiling in silence while completing a big project was something I was very comfortable with. It also helped me get fit and really enjoy exercise – particularly long bike rides and multi-hour runs on my own. I never need to wear headphones. They aren’t necessary. My own mind provides all the entertainment I need. Introversion has made me extremely comfortable spending time alone. Peace and quiet are comfort zones for me. I have no doubt that this has provided great solace, both emotionally and physically for me. It has also given me a greater capacity to communicate and glean information from others without saying much. It is said that only 7% of information is communicated verbally through words. The rest of communicated through vocal tones, sounds, posture, facial expression and other non-verbal methods. My introversion has given me the space to tap into the 93% of information that exists beyond the words being said in a conversation. I’ve always had an extreme sense of empathy for others. Even watching people getting picked-on while watching a movie is very bothersome to me. I have a great degree empathy toward others, particularly towards those with different views than my own. Perhaps it because I am a Libra and always balance both sides of a debate. This trait is something I used to think was a disadvantage. In the business world, it was my perception that only “shrewd and cunning” people who didn’t care about people’s feelings could be a success. I also thought that empathizing with others was a sign of weakness and lack of confidence in my own opinions. I now realize that none of these notions were true. This sensitivity has saved me friendships that otherwise would have fallen apart, helped me successfully finish projects at work that would have devolved into political messes, and has given me a unique ability to empathize and relate to people both during my years as a yoga teacher, and now as a Peak Performance Coach. If I always thought it was “my way or the highway,” things would have been very different and not in a good way. Hefty Ravi! 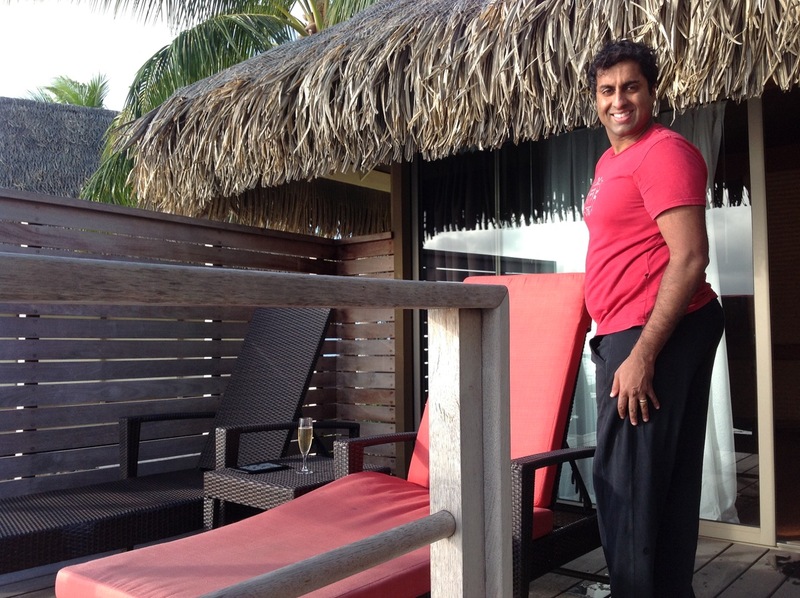 This me on my honeymoon almost 2 years ago, in August 2013. I was tipping the scales at over 190 pounds, by far my heaviest (I have a very small frame, 190 is a LOT of weight for me). I put on this weight just 2 years after completing several ultra-marathons and an Ironman triathlon. As I mentioned earlier, I was overweight as a kid. And I mean really OVERWEIGHT. For many years I was one of the heaviest kids in my class. The stress this placed on me as a young kid of 10–16 was unbelievable. Luckily, through a massive amount of self-discipline and hard work, I was able to get fit. By the time I graduated high school, I was thin as a rail and super fit. That doesn’t mean the weight has stayed off. I need to be constantly vigilant, and have gained back 10–20 pounds a few times, and most recently, put on a whopping 50 pounds in the year preceding my wedding! It is a constant struggle. The fact that I easily put on weight is a good thing in the long run, though most people would not understand why. I have spent countless hours learning about nutrition, trying out self-experiments and diving into the science and emotions behind nutrition, healthy eating, getting fit and staying fit. When I was young, I used to be furious at how I could eat the exact same foods as my brother, yet he was thin as a rail and I was a big ball of blubber. On top of it, I was vegetarian! Even worse, for years, I was massively overweight despite swimming up to 5 miles a day on the swim team! Aren’t vegetarians supposed to be skinny? How could I spend hours swimming laps and still be so overweight? It made no sense! Now I understand that there were a variety of reasons why I gained the weight and kept it on, and my insights have helped me self-correct when I start to gain weight again, and have given me a lasting life skill to continually learn about and invest in my own health for the long-term. I never would have learned what I know now if I didn’t suffer from obesity as a kid. 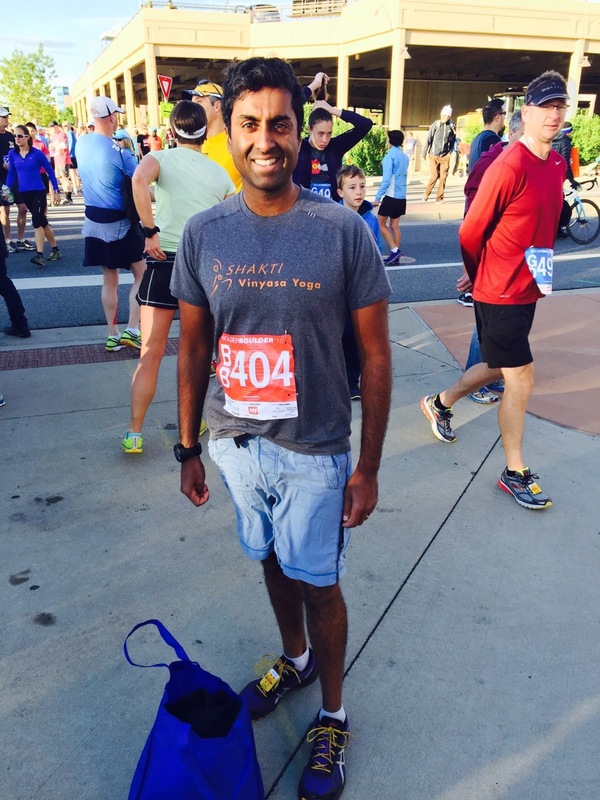 This is me a month ago, after finishing the Bolder Boulder 10K. I lost almost all the weight I had previously gained, and feel great! I hope you take the time to read Gladwell’s book, David And Goliath. It’s entertaining as he uses storytelling to make his key points, not just bland pages of research. Identify areas where you consider yourself an underdog, a misfit or are disadvantaged. How could those situations be long-term strengths that set you up to win at your own game of life?